Kathy Griffin is an American actress, comedian, writer, producer, and television host. 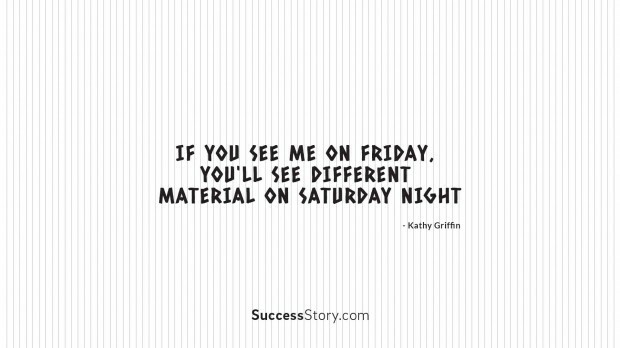 Kathy Griffin is a multi talented personality with penchant for humorous quotes and satires. She has always been straight forward with truthful attitudes and she always said whatever she felt right. Her quotes show her determination and fearless attitudes. She inspires us to be truthful and opinionated as she had always frankly presented her opinions on everything or every person. "If you see me on Friday, you'll see different material on Saturday night"
She is a Guinness World Record Holder for the number of aired TV specials on any network and she inspires everyone to dream big and work hard to achieve them. She has always supported the right cause and teaches every human being to work the society with her quotes and life. Her quotes are famous for conversational style and controversial statements on celebrities, religion and sexuality. She has always been upfront that is quite evident from her quotes which harshly comments on many issues. She inspires every person to be fearless and don’t be afraid of saying the truth to anyone. A great achiever who achieved a lot inspires us to dream big and motivate us to achieve those dreams with our sheer dedication and hard work. Like her personality quotes are straight to the point and comment on everything which she doesn’t like. She inspires and motivates us to improve every day. She never backs down on saying anything even if those things may hurt someone and exactly the same is with her quotes she always say whatever she wants without the fear of anyone and anything.